This year marks the 70th Anniversary of the founding of Bishopthorpe Social Club, and to celebrate this milestone the Club is presenting a display of photographs, memorabilia, documents and archive material relating to the history of The Poplars (the house before it became the club) and Bishopthorpe Social Club. The event is on Saturday 27th August – 5pm start. 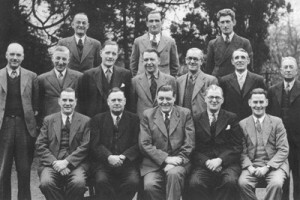 The founder members of the club pictured in 1946.